Industrial Human Machine Interface (HMI) series are panel PC and operator panel for a wide range of industrial and factory automation applications. The touch panel computers come in various sizes especially for size-sensitive factory environment. 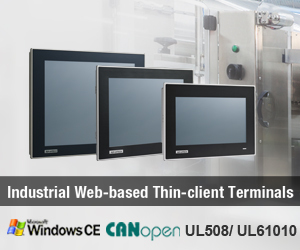 Advantech's Industrial Web-based thin-client terminals are reliable, durable, and ideal for faster and lower-cost HMI applications that require monitoring, controlling, and displaying information in dynamic ways.